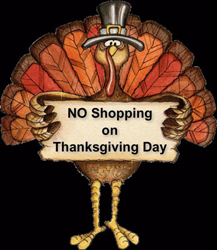 Local Small Business Says No to Opening on Thanksgiving Holiday. Why should anyone wait in long lines and sleep in tents to save? Spend time enjoying Thanksgiving with your friends and Family. Join us for Yellow Wednesday. Camping is for a gaming strategy not for shopping. Local Small Business Decides Enough is Enough. The Gamers Edge wants shoppers to spend time with their families and friends instead of getting mixed up in crazy traffic, long hours and not enjoying what the day is really about. Hence, Yellow Wednesday, November 26th, 2014, from 5pm to Midnight, celebrating the sale a day before Thanksgiving so shoppers can enjoy their video games and electronics with family on Thanksgiving. We are a local business that has great roots in Ocala, FL. Our employees believe that the people in the community should not have to sleep in tents, wait in long lines, shiver in the cold or any other dramatic thing to save money. So they created this sale to encourage shoppers to come out before Thanksgiving, save a lot of money, and still enjoy their Holiday. If shoppers still like to wait until Black Friday, The Gamers Edge will be opening back up at 6am on Friday for the Shoppers' convenience. So don’t delay, come by this location 3131 SW College Rd, Ste. 207, Ocala, FL across from the Paddock Mall in the College Park Plaza. So Say NO to Opening on Thursday with us. What is The Gamers Edge all about? One might remember Atari or Coleco, the dawn of home console gaming, the Gamers Edge has video games dating from the 1970’s all the way to the newest systems. Our company prides itself in being able to bring back the retro as well as into the future, all while giving the customer a great value. From Atari to Intellivision, Nintendo to WiiU, Playstation 1 to Playstation 4, XBOX to XBOX ONE, Music CDs to DVDs and Blu-Rays, Pokemon Cards to Magic Cards, iPods to iPhones, if it’s electronic and fun, we take pride in having it available for consumers. At our store all will be treated like family. We enjoy helping everyone with all their gaming needs. Local Business says NO to Opening on ThanksgivingA local Ocala Business say No to Opening on Thanksgiving and Yes to no long lines.